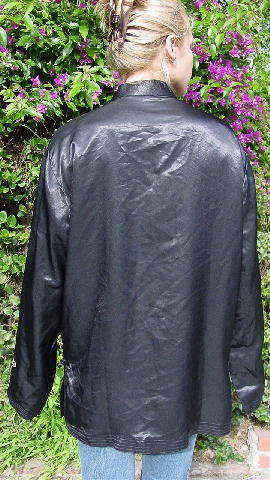 This black (it's either silk or a very nice polyester) Asian jacket has a Mandarin collar and long sleeves with 5 horizontal rows of stitching at the bottom. The bottom hem and two lower open front pockets also have the same 5 rows of stitching. 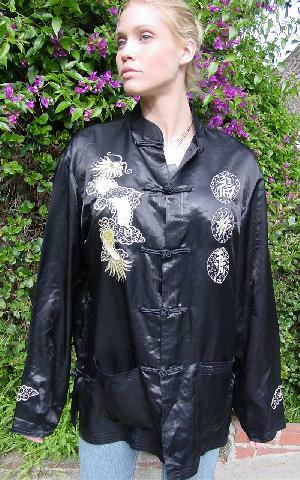 Above the sleeve stitching is a yellow embroidered design. The front has five frog closures and the left front side has three horizontal embroidered yellow designs and writing. 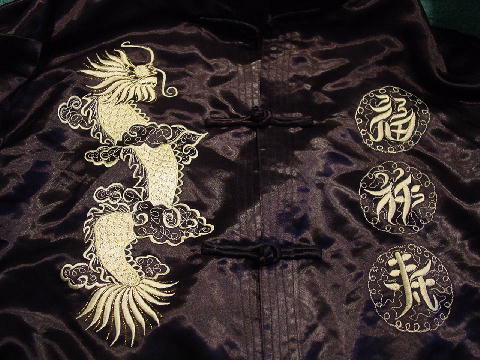 On the right side is a large yellow and gold thread embroidered Chinese dragon. The side seams have 6" bottom slits with a frog closure above each slit. It has very nice fabric and detailing. It was used in a movie. shoulder to end of sleeve 25 1/2"
shoulder to hem 30 1/2"